The FCC has posted approval documents (FCC ID QURRM-42)for the Nokia N90. The N90 is one of three new NSeries high-end phones that Nokia introduced late last month (see also N70 and N91). 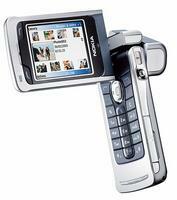 The N90 features a high-resolution camera among its features: * 2 megapixel autofocus camera with flash and video capture. Lens made by Carl Zeiss. * Massive 352 x 416 pixel 262K color main display (plus a 128 x 128 pixel outer display) * Nokia XpressPrint * RS-MMC slot * Symbian Operating System The Nokia N90 is slated to ship during the current quarter.